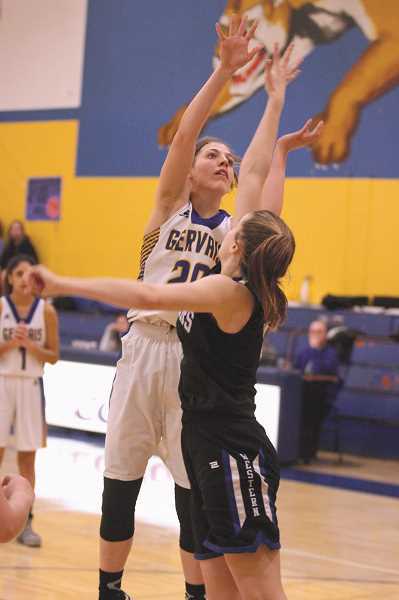 The Gervais girls basketball team is eager to stake its claim as the second best team in the Tri-River Conference, but the Western Christian Pioneers had something to say about that after defeating the Cougars 45-36 on Friday night at Gervais High School. 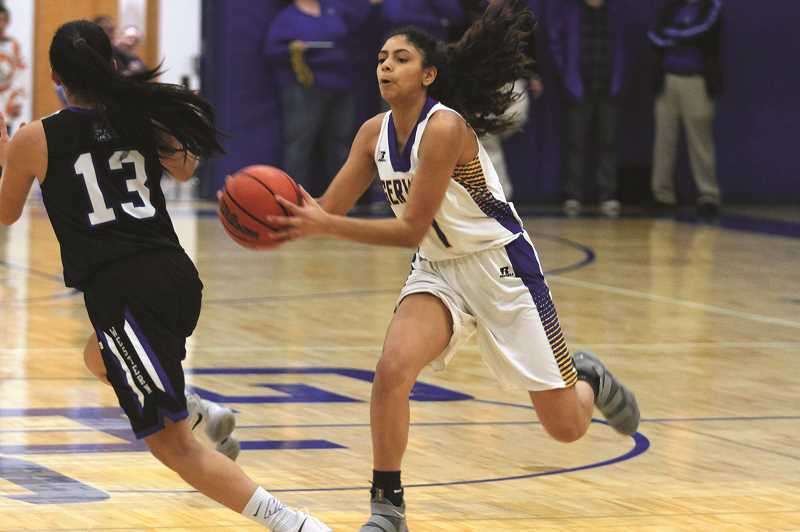 Gervais entered their penultimate home game of the regular season playing their best basketball of the year, winning seven of their past eight games with their lone loss coming in a hard-fought contest against the No. 1 Kennedy Trojans. But the Pioneers had won three straight and were looking to repay the favor after Gervais prevailed by 16 points at Western Christian's home court in January. After the opening quarter of play on Friday, Gervais led 6-5 in what looked to be a defensive showcase for both teams before the Pioneers blew the game open with a barrage of 3-pointers and never looked back. Western Christian opened the second period with three consecutive field goals from beyond the arc as part of an 18-2 run. Gervais, meanwhile, struggled to maintain control of the ball, recording more turnovers than shot attempts in a slump that lasted all the way until the halftime buzzer before sophomore Lily Welburn hit a shot in the final seconds to bring her team to within 23-10. The Pioneers' hot touch continued into the third quarter when senior Annika Hess and sophomore Makennan Hopper each back-to-back triples early in the period to put Gervais behind 31-13. But the Cougars were not ready to give up. As Western Christian's touch from outside began to cool, Gervais methodically chipped away at the deficit. Bucket-by-bucket Gervais went on an 8-0 run over the remainder of the third period to pull within 31-21 heading into the final quarter. Gervais had a difficult time getting any closer, however, due to miscues at the free throw line. During the Cougars' rally, the team missed seven consecutive freebies, allowing Western Christian to recover and expand their lead to 38-23. The game appeared all but decided until Gervais went on one last run, scoring nine consecutive points punctuated by a 3-pointer from sophomore Araceli Vasquez with 1:37 left to play that pulled the Cougars within 38-32. That's as close as Gervais could get. Needing to foul Western Mennonite to get more scoring opportunities, the Pioneers took care of business at the foul line, hitting 7-of-10 free throws in the final 90 seconds to secure the win. Welburn had nine points and five rebounds in the loss, while teammate Katie Hansen had seven points to go along with a team-best eight rebounds. The loss gives Gervais (16-7, 9-4 Tri-River) just a one game lead over the Pioneers (12-10, 8-5) in the conference standings with one game left to go. Prior to Friday's loss, the Cougars won had gone 2-0 earlier in the week, opening with a 38-34 over the No. 8 Santiam Wolverines (15-8, 6-6) on Jan. 28 and following with a 33-25 road victory against the Colton Vikings (8-15, 5-8) on Jan. 30. Hansen led the team with nine points, eight rebounds and two steals in the victory over the Vikings, making up for a one-point loss to Colton on Jan. 9. Versus Santiam, Welburn had 12 points, seven rebounds a block and a steal in the win, sweeping the season series against the Wolverines. Gervais was scheduled to conclude its regular season on Tuesday against the Culver Bulldogs (14-7, 6-6).